If you go online and look for a side sleeper guide, you will learn a lot of tips on how you can lessen the possibility of suffering from body pain when you wake up. In this case, one of the most important things that should be done is to invest in the best pillow. Looking for the perfect choice? Keep on reading and we will tell you more about Snuggle-Pedic Ultra-Luxury Kool Flow Memory Foam Pillow. 100% Certi-Pur U.S. Certified Foam: Before being publicly introduced, the product has undergone rigorous testing to ensure that it adheres to the strict standards imposed by relevant organizations. This can provide you with the confidence that the foam is indeed premium when it comes to quality. Kool-Flow Micro-Vented Cover: One of the problems with most of the side sleeper pillows is that they can be too hot, especially when used during the summer season. This is not going to be a problem with this model. The cover is designed in such a way that it encourages breathability. It provides proper air circulation, making the user well-ventilated. 20-year Warranty: This is a reflection of the commitment of the manufacturer towards promoting the highest quality in all of their products. For two decades, you can be assured of dependable customer support. Its warranty coverage is perhaps one thing that its competitors will find hard to match. Orthopedic Support: Because it is made from memory foam, it is going to be naturally supportive and comfortable. It will conform to the shape of the body of the user, allowing the pillow to provide customized comfort. It is going to provide the support that is needed by the neck, especially if you are a side sleeper. No-Flat Technology: One of the best things about Snuggle-Pedic Ultra-Luxury Kool Flow Memory Foam Pillow is its no-flat technology. Even with prolonged and frequent use, you can expect the shredded memory foam inside the pillow to remain firm. High-Quality Cover: In many of the pillows for side sleeper reviews, one more thing that is often given words of praises is its cover. It is made from bamboo, a natural material that can deliver a wide array of benefits, such as being hypoallergenic and its ability to resist dust and mite. Provides Personalized Comfort: This is one benefit that holds true in the case of memory foam pillows in general. Your body will put pressure on the pillow and its shape will be personalized. Initial Odor: This is not a big thing. The chemical-like smell can be experienced within the first few days of use. After which, it will just disappear on its own. A Bit Firm for Some Users: If you are used into sleeping in plush, cushioned pillows, you might need some time to adjust with this pillow as some have reported that it can be a bit firm. 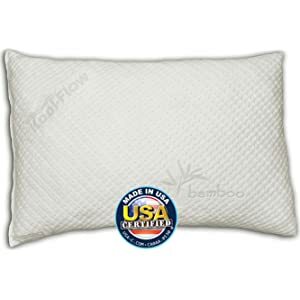 The Snuggle-Pedic Bamboo Shredded Memory Foam Pillow can indeed prove to be an excellent choice. From the material of choice in the main pillow to the construction of its eco-friendly cover, this is an option that is going to be hard to match by any other name in the market.